Iran on Wednesday condemned the "provocative" publication of a new caricature of the Prophet Muhammad on the cover of French satirical weekly Charlie Hebdo, calling it an insult to Islam. Foreign Ministry spokeswoman Marzieh Afkham said the publication of the cartoon "provokes the sentiments of Muslims the world over." Iran has strongly condemned last week's deadly assault on the magazine's Paris office by Islamic extremists who killed 12 people, including much of the weekly's editorial staff and two police officers. Afkham said the attack was against Islam's teachings. The issue of the magazine that came out Wednesday features an image of the prophet holding a "Je suis Charlie" ("I am Charlie") sign beneath the banner headline "Tout est Pardonne" ("All is Forgiven"). The magazine was to produce at least 5 million copies -- more than 50 times the usual circulation. Newsstands in Paris quickly sold out Wednesday morning. Islam forbids depictions of Muhammad or other prophets. Al Qaeda's Yemeni affiliate claimed last week's attack, casting it as revenge for the magazine's earlier publication of caricatures of the prophet deemed offensive. A Turkish court, meanwhile, ordered the country's telecommunications authority to ban access to web pages showing Charlie Hebdo's front cover with the image of the Prophet Muhammad, a state-run news agency said Wednesday. The Anadolu Agency says the court in Diyarbakir, southeast Turkey, ordered the ban on Wednesday. Earlier, police stopped trucks leaving a pro-secular newspaper's printing center and checked the paper's content after it decided to print a selection of Charlie Hebdo caricatures. 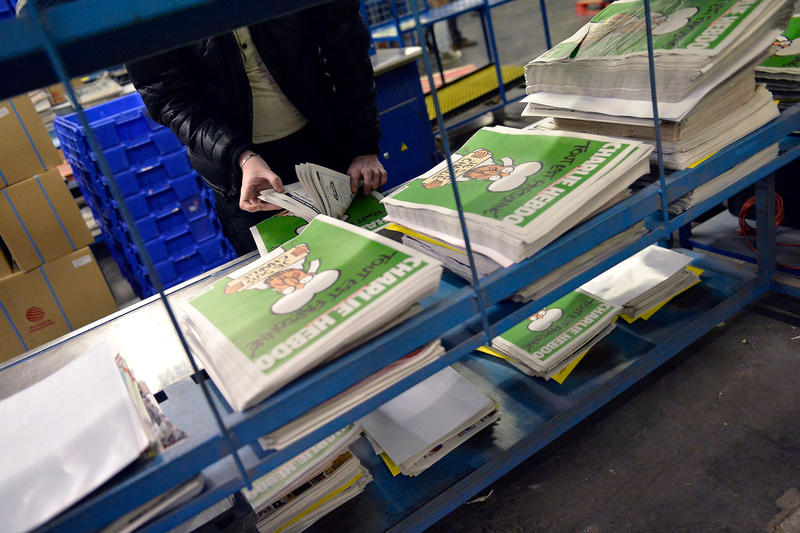 Cumhuriyet newspaper said police allowed distribution to proceed after verifying that the satirical French newspaper's controversial cover featuring the Prophet Muhammad was not published. The paper printed a four-page selection of cartoons and articles on Wednesday in a show of solidarity with Charlie Hebdo but left out cartoons which Muslims may find offensive. However, two Cumhuriyet columnists used small, black-and-white images of the Charlie Hebdo cover as their column headers in Wednesday's issue. "While preparing this selection, we respected societies' freedoms of faith and religious sensitivities," said Cumhuriyet's editor-in-chief Uktu Cakirozer. He did not mention the two columnists' decision to use images of the cover in their columns. Police intensified security outside Cumhuriyet's headquarter and printing center as a precaution. A small group of pro-Islamic students staged a protest outside the paper's office in Ankara, the state-run Anadolu Agency reported.